Umbra brings affordable design to an everyday item with the Splat Trivet. 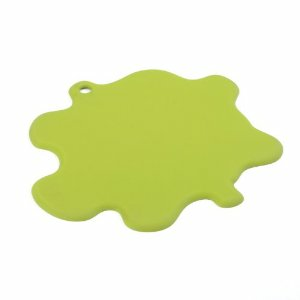 This molded-rubber hot pad features a whimsical curvy edge and helps protect countertops and tables from burning. Heat-resistant up to 500 degrees Fahrenheit; easily wipes clean. Available in an array of fun colors. Measures 8-1/2-inch in diameter by 0-1/4-inch thick. Designed by Alan Wisniewski exclusively for Umbra - a worldwide leader in casual, contemporary and affordable design for the home.